Lila Ammons @ Tangiers, Minneapolis. 8pm (No Cover) Vocalist Ms Ammons is getting ready to head off for another tour of Europe during late September through October. Stop by and see her perform jazz and blues standards at this lounge with comfy, large booths and leather sofas. Asher Kurtz @ Jazz Central, Minneapolis. 8:30pm ($10 suggested Donation) This young guitarist is only 22 and already making a name for himself. After recently graduating from Berklee College of Music, he toured Europe with Terri Lyne Carrington, and has settled in NYC. Here’s a video of him with a group including Twin Cities trumpeter Jake Baldwin. Jason Weismann & The ‘Q’ @ Crooners Lounge & Supper Club, Fridley. 7pm (No Cover) Weismann is an emerging saxophonist active in a number of groups as well as a vocalist in the crooning tradition with his own band. With The “Q” he performs songs by Sinatra, Chet Baker, Mel Torme, and similar jazz vocalists. Plus, he can get into a funky groove as well. Lund, Paris, & Scofield @ Jazz Central, MInneapolis. 8:30pm ($10 Suggested Donation) Three vocalists for the price of one. Jennifer Lund has sung mezzo-soprano with the Minnesota Chorale for the last 14 years, and began studying jazz a few years ago. She’s a student of Vicky Mountain. Suzanne Paris made her debut with the Milwaukee Symphony Orchestra Jazz Unlimited Series, and has sung backup to many recording artists. Susan Scofield has been singing since the age of 5, has performed with the St. Paul Chamber Orchestra and the Swing Beat Big Band, and is currently a member of Vocal Essence. Evan Benidt Quintet @ Jazz Central, MInneapolis. 8:00pm ($10 Suggested Donation) Saxophonist Benidt and his group: Joe Mayo, sax; Javi Santiago, piano; Greg Byers, bass; and Mac Santiago, drums – will feature jazz blues, and rock, from jazz standards to Joe Satriani. 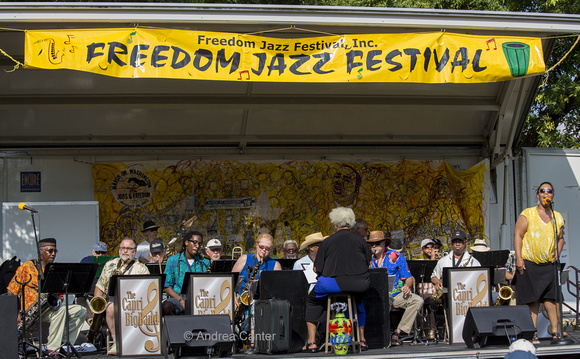 Freedom Jazz Festival @ Minnehaha Park, Minneapolis. Noon – 6pm (Free) Often called “The best little jazz festival in town,” this year’s lineup includes The George Scott Trio: The Tangents; Three Women of Jazz: Debbie Duncan, Yolande Bruce, & Linda Sloan; The Minneapolis Jazz Workshop; jam sessions; the Capri Big Band; and more, as well as art and family activities. Saturday Night Jazz @ The Blackdog Coffee & Wine Bar, Saint Paul. 7pm ($10 Suggested Donation) . The Zeb Cruikshank Band opens: Cruikshank guitar; Dan Musselman, piano; Brent Wallace, bass; and Byron Johnson-Blanchard, drums. They’re followed at 8:30 by Paul Harper’s Show and Tell, featuring saxophonist Harper a member of the Illicit Sextet, among other bands; Charlie Riddle, bass; Mike Cramer, guitar; and Pete Hennig, drums. Kate Lynch & Her Most Excellent Fellows @ Crooners Lounge and Supper Club, Fridley. 7:30pm (No Cover) Ms Lynch is an excellent bassist and engaging vocalist, and her Excellent Fellows provide the support she needs as they play songs from the 30s to the 60s. Many of her songs are fox-trots, the kind of music to which almost anyone can dance, or medium tempo swing numbers. Here she is doing a number by the Ink Spots. The Potash Twins @ The Dakota, Minneapolis. 7pm ($10) Trumpeter Adeev and Trombonist Ezra have settled into the Twin Cities for a while after recording their eponymously titled album here produced by Steven Greenberg of Funkytown fame. Though both are only 21, they’ve managed to play and study with an extraordinary coterie of musicians, including Wynton Marsalis and Jon Baptiste, the music director for Steven Colbert’s new show. they’ve also performed at Jazz at Lincoln Center, South by Southwest, Birdland, and Warren Buffet’s Annual Shareholder’s meeting. Their music is jazz wrapped up in pop sensibilities, or as guitar ace Cory Wong puts it, their music falls “someplace between Katy Perry and Miles Davis.” A CD release party earlier this summer was sold out at the Icehouse. Here they are talking about their music. Chris Lomheim Trio @ Crooners Lounge & Supper Club, Fridley. 7pm (No Cover) Sometimes subtle, often inspired, and always ear-pleasing, pianist Lomheim leads a trio through some cool tunes. Connie Evingson & The Parisota Hot Club @ Vieux Carre, Saint Paul. 8pm ($5) Robb Henry, Matt Senjum, and Jay Epstein, aka The Parisota Hot Club along with special guest Dave Karr on sax, provide the support as Ms Evingson explores Django Rheinhardt-inspired tunes. BB King Birthday Bash with Ray Covington @ Crooners Lounge & Supper Club, Fridley. 7pm – 10 pm (No Cover) BB King was, perhaps, the most jazz-oriented of all blues musicians, so having Covington, who can easily traverse jazz, blues, and old school R&B, perform some of King’s music is practically a no-brainer. Here he is doing a slow jam. Heritage Blues Orchestra @ The Dakota, Minneapolis. 7pm ($45), 9pm ($35) This aggregation is dedicating to showcasing the power and possibilities of African American music. They combine the energy of gospel, the emotion of the blues, and the power of field hollers, and gospel music to create something new, getting rave reviews from the Wall Street Journal, Vintage Guitar Magazine, and Downbeat in the process. Paul Cebar’s Tomorrow Sound @ The Minnesota Music Cafe, Saint Paul. 8pm ($10?) Cebar’s eclectic taste in music can be heard on his Wednesday morning radio show on WMSE in Milwaukee (www.wmse.org), where he plays a mix of deep soul and R&B, as well as Brazilian, Cuban, African, classic ska & reggae, and other pan-tropical songs. He takes these influences and creates infectious, highly rhythmic tunes that will have you getting your dancing shoes out of the closet to spin, twirl, and bop on the commodious dance floor at the MMC. Here’s a fun video that features the band playing as well Paul talking about music. Archie Fisher @ Landmark Center, Saint Paul. 8pm ($25, $20 advance) When Fresh Air Radio first started back in the late 70s and early 80s, Fisher was a favorite of the station’s folk programs, and still is on their playlists. The Scottish troubadour will be celebrating the release of his first album in seven years, A Silent Song, on Red House Records, which has also had a long association with Fresh Air. Al Stewart @ The Dakota, Minneapolis. 7pm ($35), 9pm ($35) Not only do we have Scottish Troubadour Archie Fisher in town tonight, but we have Scottish folk rocker, Al Stewart, who came to prominence in the late 70s with the top ten The Year of the Cat and its platinum follow up, Time Passages. He makes use use of historical references and literary sources in his songwriting, with The Lord of the Rings providing inspiration for his very first single in 1966, and has never stopped recording or touring. His latest album, Uncorked, has received very postive reviews. It is a live venture that showcases the breadth of Stewart’s writing yet stays away from the obvious hits of his career. Here’s what you can expect. Annual Rockin’ Music Fest @ Shaw’s Bar & Grill, NE Minneapolis. 4pm – close. (No Cover) The Brian Naughton Band will be starting the festivities at 4pm. Naughton will be especially rockin’ since he’s celebrating a birthday. At 8:00, Shannon Curfman will take the stage. The exciting guitarist has sold a quarter million albums and has been Kid Rock’s duet partner, background singer, and guitarist since 2010. At 10pm things move inside when Paul Mayasich and the RAMM Band take to the stage. Here’s Curfman doing a classic from the 70s. Dee Miller Band @ Holihan’s Pub, White Bear Lake. 8pm (Tip Jar) Get yourself some earth-shakin’ blues with Ms Miller and her cohorts, who will pack the tiny club and deliver your blues jones with gusto. 7.8 Rock the Rubble featuring Albatross @ Bedlam Lowertown, Saint Paul. 1pm – 5pm ($20-$35 Advance, $40 Door) Nepal suffered through twin devastating earthquakes this past Spring – one at 7.8 and the other at 7.3, with over 400 aftershocks. Nine thousand died, and over 22,000 were injured. This show featuring Albatross, a Nepalese rock band, is a fundraiser for Earthquake relief in Nepal. Albatross is a four piece with crunchy guitars, and though their lyrics are Nepalese, their sound, whether on rockers or ballads, will be familiar to anyone with a passing interest in metal and hard rock. Hot Date, folk duo specializing in love songs, and This Mad Future, a quintet from Saint Cloud, open. Here’s Albatross. Matuto and Daddy Squeeze @ The Icehouse, Minneapolis. 9pm ($15) Matuto is a New York group that uses a plethora of Brazilian instruments to play Appalachian and traditional blues combined with the rhythms of Northern Brazil. Daddy Squeeze, which opens, is another of accordionist Dan Newton’s groups that plays a swinging mix of blues, Cajun, Tex-Mex, and French rhythms. Here’s Matuto with a unique cover of Beyonce. Mambo’s Combo @ Bunker’s, Minneapolis. 9:30pm ($7) Be prepared to dance as Mambo’s Combo brings the groove to the North Loop. They’ve been playing this weekly gig since 1987, covering rhythmic rock and R&B tunes with panache and grit. Visiting and resident musicians will often sit in for a tune or two. Tom Paxton w/Joe Vezner & Don Henry @ Crooners Lounge & Supper Club, Fridley. 7pm – 10pm (No Cover) What with Archie Fischer and Al Stewart in town this week, Tom Paxton makes it a trifecta of folk music. In 2009, he received a Grammy Lifetime Achievement Award for his work, which spans more than 50 years. Paxton has written songs with enduring appeal, like The Last Thing On My Mind, Bottle of Wine (a hit for the Fireballs in the 60s), and Ramblin Boy, as well as topical protests songs about current events, like Talking Watergate, Without DeLay, about the former congressman, and Train for Auschwitz, about the holocaust. While Crooners might not be a typical venue for Paxton, it is a good listening room for the intimacy of Paxton’s performance. Check out this topical number about banks.